Wall physical tables are frame construction with panels and color inserts made of sheet steel. 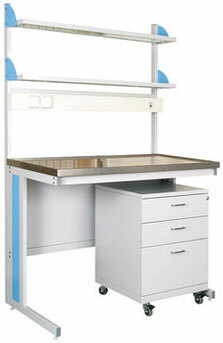 Tables have an integrated service rack with mounted shelves and electric unit. When ordering, specify the number of electrical outlets. Wall physical tables 1200 мм. Wall physical tables 1500 мм. Lines of compressed air and gases.